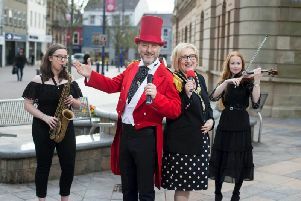 Organisers of the City of Derry International Choir Festival have opened applications for participation in the 6th edition of the autumn festival, due to take place from Wednesday, October 24 until Sunday, October 28. Following the outstanding success of the first five festivals, there are already even more ambitious plans for 2018 that include guest performances by some of the world’s most acclaimed choirs and vocal ensembles. In addition to all of the familiar elements of previous festivals – the five days of wonderful choral singing comprising concerts, workshops, choral and sacred trails, competitions and conducting masterclasses – this year’s festival will also include the opportunity for greater community participation and a wider range of visiting international choirs in 2018. School and national choirs are invited to take part in a variety of competitions that cater for all musical styles including sacred, gospel, popular and jazz music. The festival is open to all types of choral ensemble, ensuring that there is opportunity for every type of choir to enjoy the excitement of competing, meet new choirs and hear different genres of music. As always, one of the highlights of the festival will be the International Competition, in which selected choirs will compete for the prestigious ‘Oak Tree of Derry’ trophy, as well as a cash prize of £2,000. The quality and range of international choirs participating in this competition is growing each year, so early applications are recommended to avoid disappointment. Full details of how to apply along with all available festival information at www.derrychoirfest.com.